We met at Floreal Milonga, Bs As in 2012. Our instant connection, understanding and enjoyment was the starting point of years of dancing together in “las milongas” of Bs As. Our intimate and passionate dance respects and re-interprets the inheritance of our referents. We define ourselves as dancers “al piso”. We are both now based in Berlín. Griselda Duarte started dancing in 2006 in San Telmo, Bs As at “Las prácticas de Cochabamba”. She has studied with Silvio La Vía, Eduardo Pareja “Parejita”, Toto Faraldo, whom he assisted in his lessons; “Los Totis” and Natalia Games and Gabriel Angio. Her tango has almost exclusively taken place at the milongas of Bs As. Griselda possesses a unique musical taste and a profound and gentle embrace, two defining features of a “true milonguera”. She now resides in Berlin. 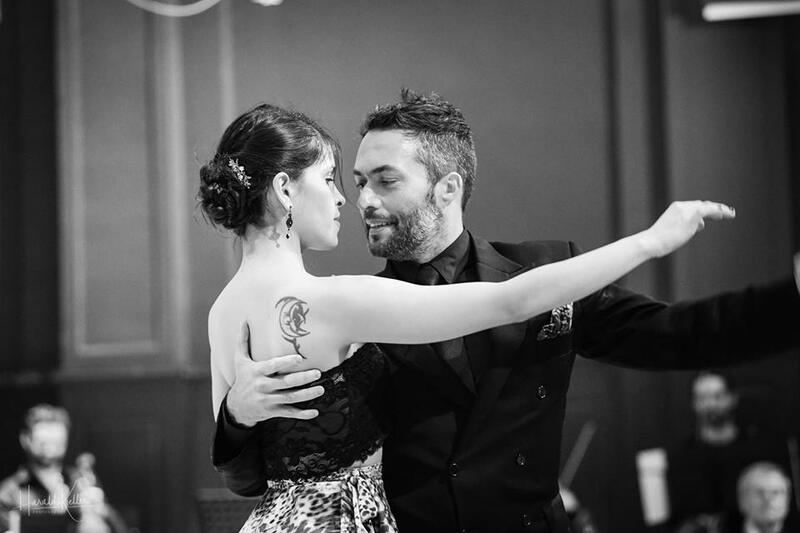 Nicolás di Rago dances tango since 1994 and works as a dancer since 1998. He has taken part in theatre shows, musicals and plays with artists such as Juan Carlos Copes, Raúl Lavié, Julián Plaza, Daniel Binelli, Hugo Marcel, Guillermo Fernández, Osvaldo “Marinero” Montes, Juan Darthés, among others. He has performed for presidents, government officers, ambassadors and celebrities from the fields of business, politics and the arts. His has performed and taught in Argentina, Germany, the UK, Switzerland, Italy, France, Spain, Romania, Czeck Republic, Tunisia, China, The Philippines and South Korea. Since 2003 he produces theatre plays and concerts and directs tango musicals. In 2004 he creates the company Estampas de Tango. In 2007 he is a finalist in Bs. As. World Tango Championship, Salón Category. In 2009 he sets up “Menesunda Tango Club”in Mar del Plata, Argentina, where his tango school is based. Since 2012 he organizes MENESUNDA TANGO SALÓN FESTIVAL in Mar del Plata, Argentina. He has been appointed Cultural and Tourist Representative of MDQ to the World by Mar del Plata City Council. He now lives and works in Berlin, Mar del Plata and Buenos Aires.